ST. PAUL, Minn. -- A 9-year-old boy in Minnesota spent his birthday giving gifts, instead of getting them. Ethan Flint told his family he wanted cash this year for his birthday, but it wasn't for him. 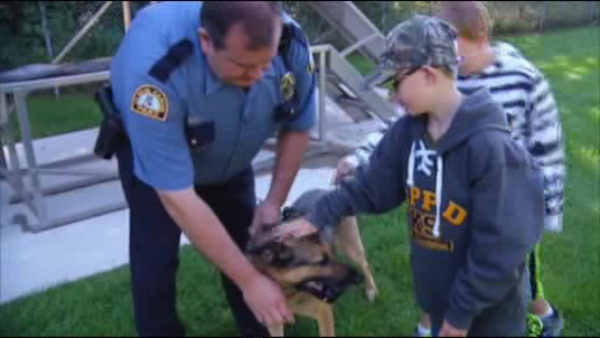 Instead, the fourth grader collected the money and presented a handmade check to the local police department to help pay for bullet-proof vests for K-9 officers. He was inspired by his love for dogs. The St. Paul Police K-9 Foundation is working to provide each dog with a custom-fit vest. Ethan presented a homemade check for $1,290 to the St. Paul K-9 unit. "I think it's outstanding that an 9 -year-old could think of something like that is remarkable," said Sgt. John Linssen, who said a vest can cost about $2600. "A vest on a human is like a vest on a dog. It covers their body. It protects them from bullets and being stabbed," said Linssen.